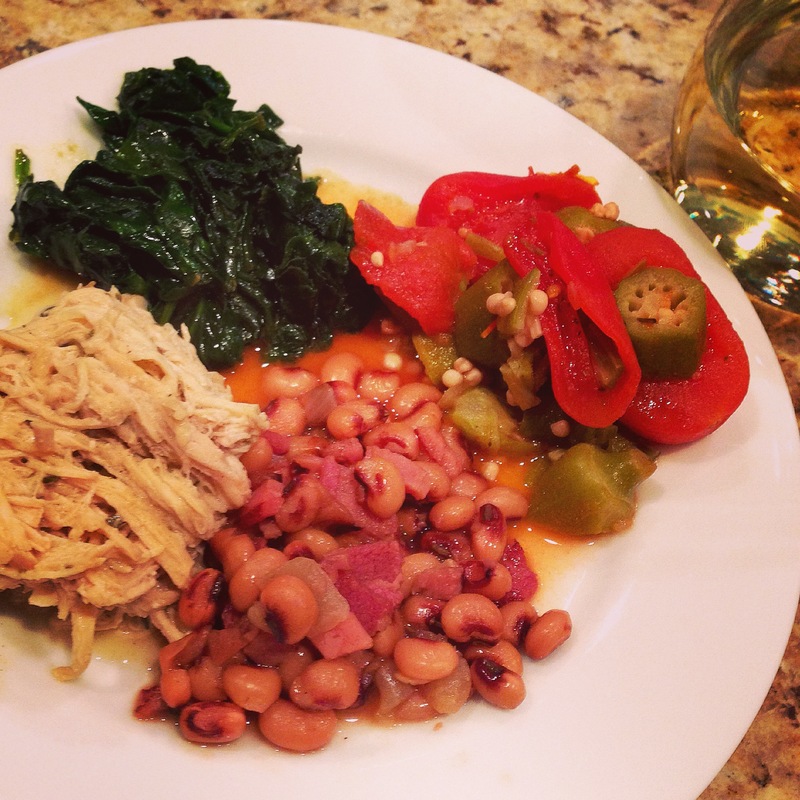 i grew up eating black-eyed peas on New Year’s Day for good luck. it’s just what we did. and in Virginia, it’s pretty much what everyone else did, too. you didn’t ask why, you just did. and if you missed ’em and had a bad year, well the next New Year’s Eve, you were more determined than ever to remember to get your fix that next day. no more taking chances. depending on where in the South you’re from, this traditional meal also comes with some combination of greens, stewed tomatoes and cornbread. but why? well . . .
other than eating this meal i knew i needed to eat for the sake of both my heritage and my future, i didn’t start my year out at all as i’d intended. i did not go for my run today. i did not finish the post i started that includes my 10 forward-looking questions/answers to finish up the series i’ve been doing. (look for that tomorrow.) heck, i barely even brushed my teeth. what i did do is dig out. i mean, like post-natural-disaster-style digging out. just like eating those old field peas for my ancestors, it was a matter of sheer survival, y’all. you see, during our post-Christmas visit to Richmond, we did what Southern families (and families everywhere) have done for generations when parents officially head off to the great beyond (a.k.a. the retirement community): we filled our car bumper to bumper with the family silver, hand-painted china, antique guns (yes, guns. probably more on that later.) and precious books. into my already-a-disaster-of-a-post-Christmas home in Atlanta, we brought even more claptrap for the overstuffed closets and cabinets. yay! literally, y’all. by the time we come to this point in the season, i am already usually feeling like the walls are coming down on me because of the sheer amount of clutter in the house between Christmas decorations, gifts everywhere, party leftovers, etc. at this point, i need a clear countertop like i need oxygen. or a Xanax. and i was now supposed to find a place for all this stuff? somebody said Xanax, right? so today, instead of running. instead of writing. instead of brushing my teeth. i spent a good 4 hours re-arranging multiple kitchen cabinets, buffets and pantry shelves just to accommodate the new-found bulk of partyware, with which we now may proudly host any of Atlanta’s most elite, international dignitaries and most certainly at least an archbishop or two. hell, y’all, we do need to have that damn Christmas party again next year — just to use all this stuff! by the end of the day (and, let’s be honest, the bottom of a couple 420s), there (surprisingly) was a place for everything, and everything in its place. just exactly the way god intended and my mental wiring absolutely requires. it was blissful. and i was thankful — both for the bounty and for the resourcefulness to make it through another day all happen. i’m hearing some Rolling Stones fade in as i type . . . it was the New Year’s Day i needed, even if it wasn’t the one i had planned. i feel so completely centered and cleared. and i lived to try again another day for the other stuff. fueled, in part, by black-eyed peas with ham & sweet onions, stewed tomatoes & okra, spinach sautéed in pumpkin seed oil and pulled chicken slow-cooked in Fly By South White BBQ Sauce. dee-lish. hope all y’all got what you needed today to start the year out right!